are there faeries in there? I confess that I have kept the details of my novel pretty close to my chest. There are a couple reasons for this. First of all, I know this about myself: if I started talking to people about this “great idea” for a story and even just one person said, “That sounds really dumb”, then that would have been it. Especially at the beginning of my writing journey. Lack of confidence in my own abilities and in my story wasn’t here, and so I would have been stopped before I even started. To avoid talking about your story until you are sure of it is advice often given to writers, and I think it’s good advice. The truth is, most story ideas need a lot of fleshing out before they can stand on their own. This one was certainly one of them. The first nugget of my novel came from two things: the privilege of seeing in person the exquisite Lindisfarne Gospels, made by monks on Lindisfarne Island in the 7th century AD, and the book, “How the Irish Saved Civilization” by Thomas Cahill. Seeing the Gospels, so much more fantastic in person then in any illustration I’ve seen in books, struck a spark of curiosity in me about the incredible talent and artistry of these monks, and about their devotion that produced one of the most beautiful works of art ever made. All done by one monk, in a cold drafty building at the edge of the known world. Cahill’s book opened my eyes to the importance of these monks in preserving the wisdom and literature of ancient civilizations after the fall of the Roman Empire and disseminating them again throughout the Continent after the chaos of the early Medieval period. Seeing the Gospels and reading Cahill’s book happened years apart, and it was years after that when I first started typing my novel’s beginning. The final propulsion for beginning the book came from another author, the wonderful Diana Gabaldon. I was a huge fan of her Outlander series, and so was delighted to read her Outlandish Companion, a book she wrote about the “behind the scenes” of her books – more information on the characters, setting, and most importantly to me, her writing process and an account of how she wrote the book! She revealed that she wrote the first one just to see if she could. Writing a book was something I always wanted to do, too, and so I finally screwed up my courage and began. Online workshops, lots or reading, and practicing writing by writing short stories followed, all with the goal of getting some competence in the craft before starting a novel. I gained some confidence and got some stories published along the way. And then it was now or never; time to get started. Thanks to Cahill’s book and the Gospels, I knew I wanted to write “something” about those two things. But what? And of course, I love fantasy – how to fit that in, too? I have always loved “portal” fantasy – books where the main character is someone from one time/place who is mysteriously transported to another. Especially ones where the main character is someone from our world. So, time travel of some sort was going to be needed. Those were the three elements that I began with, and it was enough to get me going. I am definitely a “pantser” , a term for someone who writes by the seat of their pants. In other words, no outlining, just get the words down. I have huge admiration for outliners, and I have learned to do this more as I’ve gone along, but my best writing comes when I’m just as mystified as anyone else as to how the whole thing is going to end. Time travel. Irish monks. Dark Ages Britain. Research, research, and more research. I found fascinating tidbits along the way that fit my story perfectly. For example, at first, a major storyline of my book was going to be the preservation of an important literary work, saved from the destruction of the library of Alexandria and brought to the monks at Lindisfarne. So, I had to have my story start just after its destruction in 642 AD (yes, I know, there is scholarly disagreement about this, but that’s for another day. Or blog post.). I discovered that Northumbria, where Lindisfarne is located, was a very interesting place that year. Oswald, Bretwalda (High King) of Britain, had just been killed in battle after reigning some ten years. His half-brother, Oswy, had managed to get enough support from the high-class thegns and earldomen to take Oswald’s throne. Hmm. A new king? The old order disrupted? An ambitious rival, the pagan king Penda, flush with victory after killing the powerful Oswald, rumbling along Oswy’s border? Uncertain times make for a great setting for a novel, don’t you think? Gauntlet thrown. Think, think. And one day the solution presented itself, which happened to be the answer to another question that I had thought idly about here and there for a long time. But, as Riversong* would say, “Spoilers!” so I’ll leave that out for now. Suffice to say the Fey invaded my story and then things really got interesting. Now you know a little more about my books. Yes, there is more than one. I got to the end of the “first” one and realized I had written enough for three. That darn “pantsing” thing again. I will post again about some of the characters and more about the story, but that will wait for another day! *For those who don’t know, Riversong is a character from Dr. Who, one of my favourite TV shows. Picture credit: “Autumn” by Alice Popkorn, on Flickr. 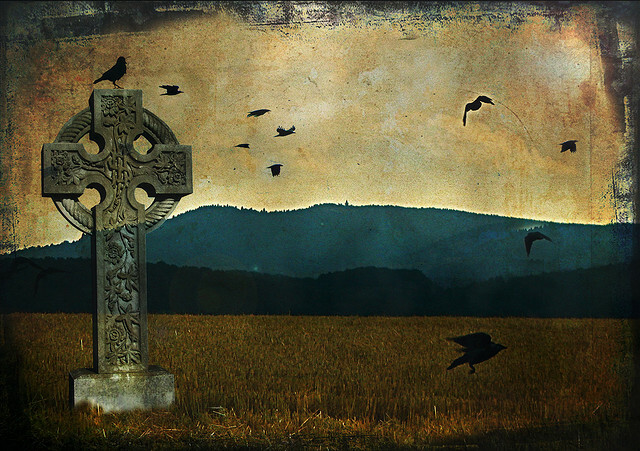 The cross and the crows….this is such a perfect picture for my book, I can’t even tell you! Have any of you followed your dreams and done something you have always wanted to do? Tell me about it! all so interesting. looking forward to reading! Finally, I have a better idea of “What it’s all about” and it has whetted my appetite!!! Sounds fascinating. I love reading about subjects that I know little about. Imalready know that you are a talanted writrer, so I know I have a treat in store! OOhhh this is going to be good. Any writer that get’s insperation from Diana G is my kind of writer! Cannot wait to read it Lisa. She sets a high standard, to be sure. I can only hope to be as entertaining as she! Can’t wait for you to read it, too.